I always admit I’m never too old to learn. 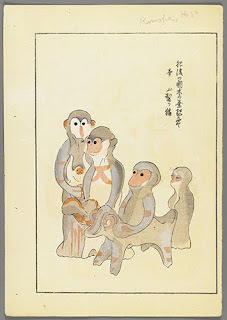 This week I learned about National/International Monkey Day, which fell on the 14th of December. The commemorative day has only been around since 2000, dreamt up by two Michigan State University art students who subsequently promoted it in their artwork. Since then it has been internationally “celebrated,” the major emphasis being on preservation of primates and their natural habitats. There is monkeyday.com that promotes the holiday and all sorts of primate news, and interestingly, a group named Primates Incorporated that guarantees the welfare of monkeys who leave research labs, private ownership, and the entertainment industry! 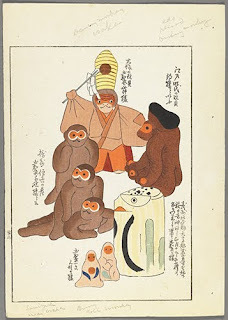 This monkey business leads to yet another interesting art historical character, a guy known as the “Professor of Toys”: Shimizu Seifu (1851–1913) (you can see more of his work in my recent Noble Carp post). Shimizu’s work probably falls on the “Nihon-ga” side of the late 1800s battle in Japan between Western style (“yo-ga”) and Nihon-ga (Japanese style) art. Nihon-ga artists were trying to preserve traditional Japanese art forms and subject matter in the onslaught of Western influences that flooded Japan after it was forced open to Western trade by the US in the 1850s. One of the interesting aspects of the Nihon-ga/yo-ga dichotomy in late 1800s Japanese art is that it provided a springboard for a lukewarm revival of the admiration for woodblock prints. The Ukiyo-e style really flagged in popularity during the 1880s and 1890s. Artists around the turn of the century did a semi-revival of the art form and it was the impetus for a revival of not only woodblock printing but also of traditional subjects such as theater prints, beautiful women prints, and prints chronicling traditional Japanese folk arts, such as toys. Shimizu founded the “Hobbyhorse Club” in 1880 or 1887, which was dedicated to aficionados of traditional Japanese toys. He was a wealthy businessman, artist, calligrapher, and the leading collector of folk art toys during his lifetime. He studied painting and printmaking under Hiroshige III (Sadaime Hiroshige Utagawa, 1842/1843–1894), a pupil of the great landscape master Utagawa Hiroshige (1797–1858). His large personal collection of folk toys was the inspiration for his publication of the series of ten volumes of woodblock prints, documenting his collection. 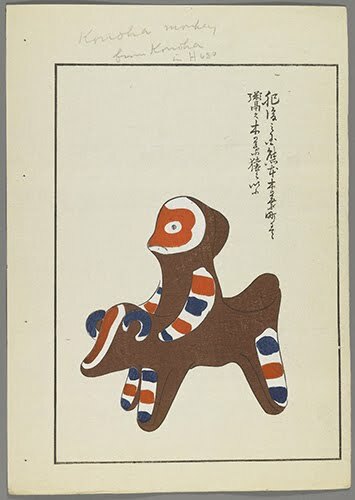 The Child’s Friend (Unai no tomo) was one of the most comprehensive publications of an ethnographic nature in the history of Japanese art. 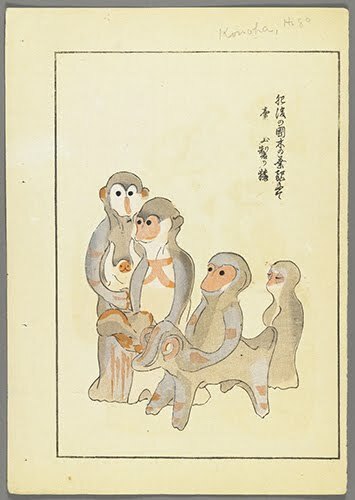 I think that these prints of monkey toys represent the Japanese macaque, sometimes called the “snow monkey,” with its distinctive red face. In 1906 Shimizu organized the first exhibition ever of traditional Japanese toys, many of them hand- made from common materials, and many from his personal collection. He published the first six volumes of Unai no tomo, and the remaining four were published by the painter Nishizawa Tekiho (1889–1965).